18853 ESS NEW CALEDONIA (1953) Msgr. Douarre*. Noumea cathedral*. Trial color proofs in strip of 5 with multicolor. Centenary of French Presence. Scott No 297, Yvert No 281. 3885 ESS NEW CALEDONIA (1959) Yate Dam*. Scott No C28. Yvert No PA70. Trial Color Plate Proofs in strip of 3. 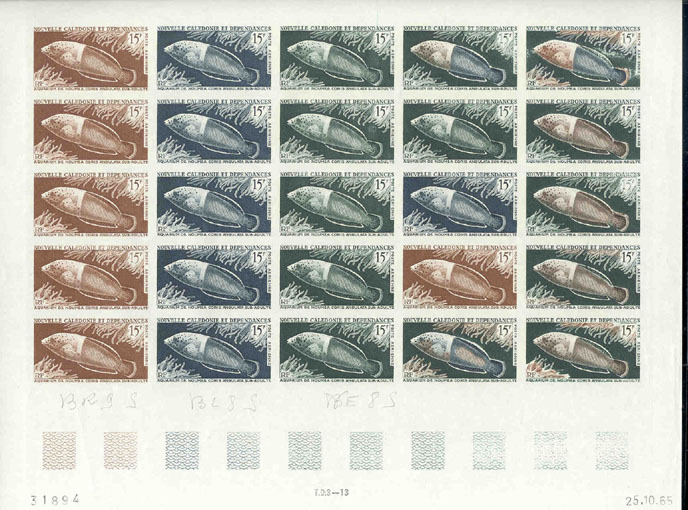 4067 ESS NEW CALEDONIA (1959) Zebrafish*. Trial color proofs in strip of 5 with multicolor. Brachyrus zebra. Scott No 307, Yvert No 291. 10753 ESS NEW CALEDONIA (1959) Rock formations at Borail*. Trial color proof. Scott No C27, Yvert No PA72. 18486 ESS NEW CALEDONIA (1959) Harlequin tusk*. Trial color proofs in strip of 5 with multicolor. Lienardella fasciata. Scott No 308, Yvert No 292. 18623 ESS NEW CALEDONIA (1959) Glaucus*. Spirograph*. Trial color proofs in strip of 5 with multicolor. Various corals. Scott No 309, Yvert No 293. 18281 ESS NEW CALEDONIA (1960) Check writing machine*. Trial color proofs in strip of 5 with multicolor. Postal cheques. Scott No 312, Yvert No 296. 19002 ESS NEW CALEDONIA (1960) Telephone receiver and stations*. Trial color proofs in strip of 5 with multicolor. Scott No 314, Yvert No 298. 4110 ESS NEW CALEDONIA (1962) Fisherman* throwing net*. Trial color proof in multicolor from corner of sheet. Scott No C29, Yvert No PA67. Lovely! 4111 ESS NEW CALEDONIA (1962) Net fishing*. Trial color proofs in strip of 5. Scott No C29, Yvert No PA67. 4770 ESS NEW CALEDONIA (1962) Sail rock*. Sailboat*. Trial color proofs in strip of 5 with multicolor. Scott No 320, Yvert No 304. 10180 ESS NEW CALEDONIA (1962) Skin diver hunting bumphead surgeonfish*. Trial color proofs in strip of 5. Scott No C31, Yvert No PA69. 11163 ESS NEW CALEDONIA (1962) Nautilus shell*. Scott No C30. Yvert No PA 68. Trial Color Plate Proofs in strip of 5 with multicolor. **. 16159 ESS NEW CALEDONIA (1962) Skin diver hunting bumphead surgeonfish*. Trial color proof pair. Scott No C31, Yvert No PA69. 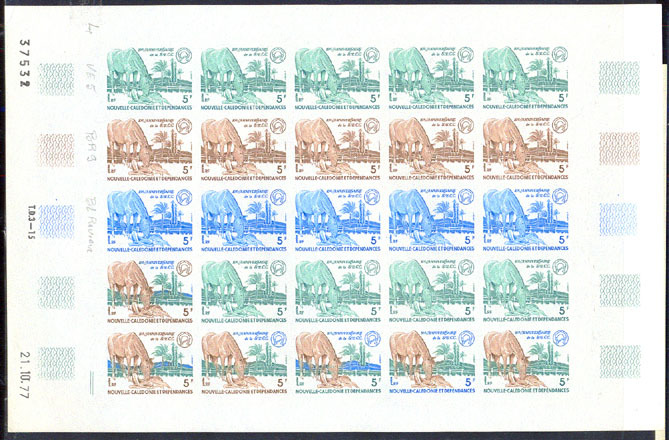 18900 ESS NEW CALEDONIA (1962) Sail Rock*. Sailboats*. Trial color proofs in strip of 5 with multicolor. Scott No 320, Yvert No 304. 18626 ESS NEW CALEDONIA (1964a) Ascidies polycarpa*. Trial color proofs in strip of 5 with multicolor. Sea squirts. Scott No 338, Yvert No 322. 18627 ESS NEW CALEDONIA (1964c) Blue harlequin shrimp*. Trial color proofs in strip of 5 with multicolor. Scott No 340, Yvert No 324. 10158 ESS NEW CALEDONIA (1965) Coris angulata (sub-adult)*. Trial color proofs in full sheet of 25! Nouméa Aquarium issue. Scott No C42, Yvert No PA82. Extremely scarce and gorgeous! 16523 ESS NEW CALEDONIA (1965) Alcyonium catalai*. Trial color proof in dark green. Scott No 339, Yvert No 323. 18630 ESS NEW CALEDONIA (1965b) Alcyonium catalai*. Trial color proofs in strip of 5 with multicolor. Scott No 339, Yvert No 323. 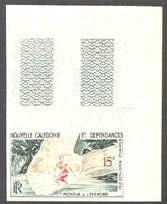 18945 ESS NEW CALEDONIA (1966b) High Jump*. Trial color proofs in strip of 5 with multicolor. 2nd South Pacific Games. Scott No 348, Yvert No 332. 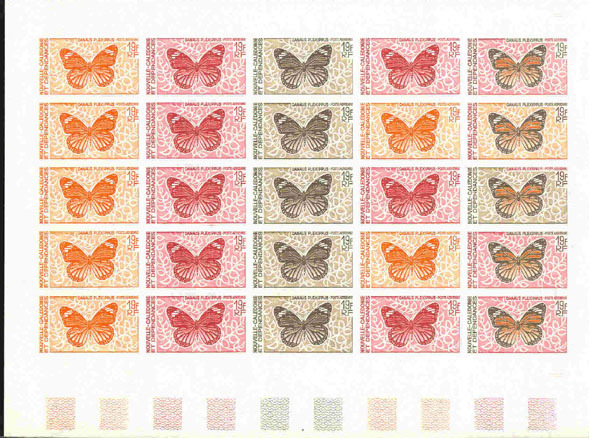 3660 ESS NEW CALEDONIA (1967a) Butterfly*. Trial color proofs in strip of 5 with multicolor. Papilio montrouziere. Scott No 357, Yvert No 341. 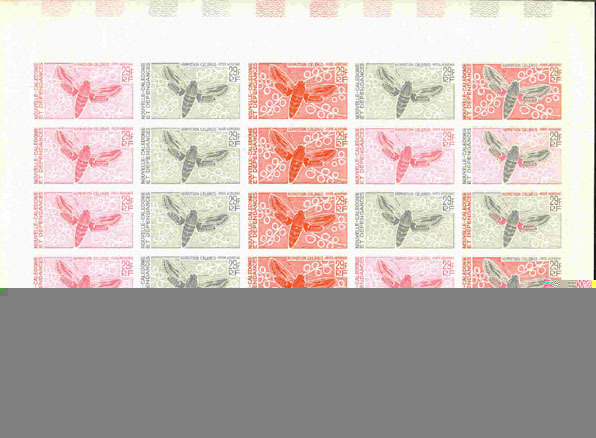 3661 ESS NEW CALEDONIA (1967b) Butterfly*. Trial color proofs in strip of 5 with multicolor. Hypolimnus bolia (male). Scott No 359, Yvert No 343. 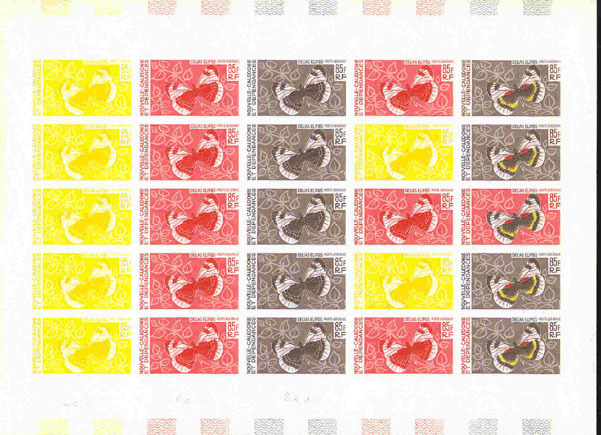 4581 ESS NEW CALEDONIA (1967a) Sea squirts*. Trial color proof with multicolor. Noumea aquarium. Scott No 338, Yvert No 322. Not easy to find! 4582 ESS NEW CALEDONIA (1967c) Blue Harlequin shrimp*. Trial color proof in brown. Noumea aquarium. Scott No 340, Yvert No 324. 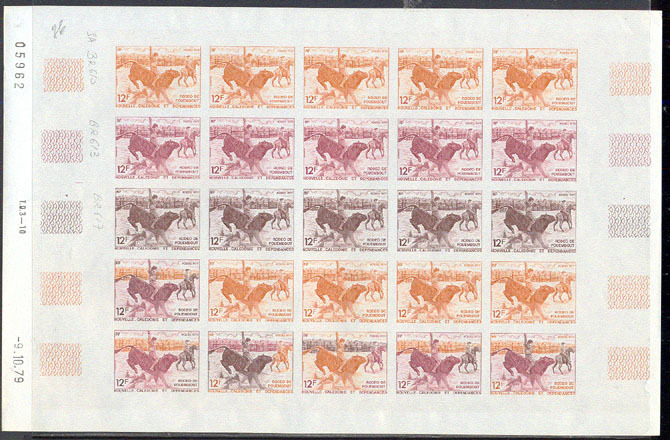 102 ESS NEW CALEDONIA (1969) Cattle dip*. Trial color proofs in strip of 5 with multicolor. Scott No 372, Yvert No 357. 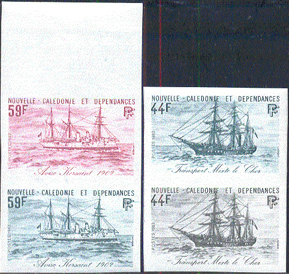 18950 ESS NEW CALEDONIA (1969) Boxers*. Trial color proofs in strip of 5 with multicolor. 3rd South Pacific Games. Scott No 378, Yvert No 362. 3450 ESS NEW CALEDONIA (1970) Planes flying around globe*. Trial color proof corner block/4. Scott No C72, Yvert No PA112. 5539 ESS NEW CALEDONIA (1971) Morse recorder*. Satellite*. Trial color proofs in strip of 5 with multicolor. World Telecommunications Day. Scott No 390, Yvert No 374. Not easy to find! 17583 ESS NEW CALEDONIA (1971) Morse recorder*. Communications satellite*. Scott No 390. Yvert No 374. Third World Telecommunications Day. Trial Color Plate Proofs in strip of 5. **. 17201 ESS NEW CALEDONIA (1973) Steamship "El Kanatar" passing through Panama Canal*. Trial color proofs in strip of 5 with multicolor. First passage by steamship to Marseille. Scott No C100, Yvert No PA141. 2819 ESS NEW CALEDONIA (1974) UPU emblem*. Trial color proof in turquoise blue. UPU Centenary. Scott No C119, Yvert No PA159. Hard to find! 4428 ESS NEW CALEDONIA (1977) Mare* and foal*. Trial color proofs in full sheet of 25. Preservation of Caledonian horses. Scott No 433, Yvert No 415. 3201 ESS NEW CALEDONIA (1978) Maurice Leenhardt*. Trial color proofs in strip of 5 with multicolor. Leenhardt was an anthropologist and missionary who struggled for the recognition of the Kanak culture in New Caledonia. Scott No 439, Yvert No 422. Hard to find! 3130 ESS NEW CALEDONIA (1979) Bull rider*. Trial color proofs in strip of 5 with multicolor. Pouembout rodeo. Scott No 450, Yvert No 433. 3131 ESS NEW CALEDONIA (1979) Bull riding*. Trial color proofs in full sheet of 25. Rodeo. Scott No 450, Yvert No 433. 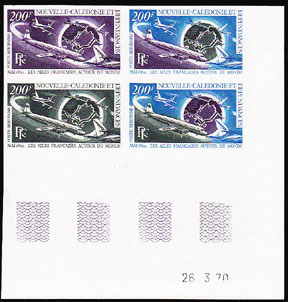 3909 ESS NEW CALEDONIA (1980) de Gaulle*. Trial color proofs in strip of 5 with multicolor. Scott No C168, Yvert No PA208. 18912 ESS NEW CALEDONIA (1981a) Corvette "Constantine"*. Trial color proofs in strip of 5 with multicolor. Scott No 466, Yvert No 449. 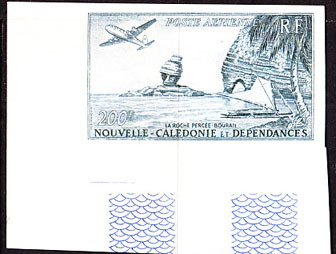 18913 ESS NEW CALEDONIA (1981b) Aviso "Le Phoque"*. Trial color proofs in strip of 5 with multicolor. Scott No 467, Yvert No 450. 17215 ESS NEW CALEDONIA (1982) Barque "Le Cher"*. Aviso "Kersaint"*. Set of 2 trial color proof pairs. Scott Nos 476-7, Yvert Nos 459-60.